The smells, colors and sounds of the holidays seem to begin earlier every year. Starting in November everyone begins digging out the holiday decorations in preparation for the reunion of family and friends. This is also a great time of the year for a festive fundraiser. People are generous around this time of the year and they love to decorate their home with beautiful Poinsettias. 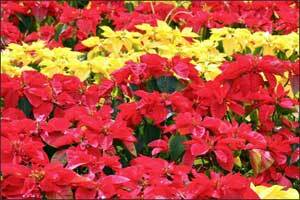 Poinsettia sales are easy, fun and can net a great profit for your cause. Plus, with proper care, these festive plants will last well past the holidays. You can raise a few hundred dollars or tens of thousands of dollars with poinsettias. It all depends upon the size of your group, the number of volunteers you can get and the effort they put forth. You can expect a gross profit between 45-55%, depending on the items selected and the number sold. There are a number of suppliers that will allow fundraisers that can be located online. The key is finding the one that offers the best profit and easiest system of selling. The best way to determine is to review the company’s policy and ask them up front what part of the fundraising profit that your charity will receive. You do however want to ensure that the company is reputable, because your buyers want a quality plant. Your profit range will be determined by the amount that you make off of each plant and how many you sell. Some groups will go door to door and others will find a place to set up and take orders. Remember to set up in a location that has a great deal of traffic, the more that see you the better that your profit will be. The possibilities are limitless with Poinsettia sales. This is not a fundraiser that targets one group and that is why it is such a great money maker. Everyone loves flowers and likes to decorate for the holidays. You bring them a quality plant and they will furnish the cash. Remember that the deliver date may be between thirty and sixty days from your order, so be sure to schedule your sale in time for the holidays.